We are delighted to present to you the New York Times bestselling author, DEBORAH UNDERWOOD this week! KidLit411 is super excited because Deborah is the author of many books including the family favorite and New York Times bestseller, HERE COMES THE EASTER CAT. Deborah is kind enough to be giving away a copy of her new book, GOOD NIGHT, BADDIES at the end of this interview. Tell us about your background and how you came to write for children. My college degree is in Philosophy. After college I did some freelance writing, some busking, some temping, and I ultimately got a job typing memos for accountants. Somewhere along the way I decided I wanted to write picture books. When everyone in our office was laid off in 2000, it seemed like it was time to take the leap to children’s writing. I read about writing, read tons of picture books, joined SCBWI, took classes, wrote crummy manuscripts, got into several critique groups, got better, got an agent, and sold my first fiction book. What projects are you working on now, any sequel to GOOD NIGHT, BADDIES or any of your other books? I’m between projects at the moment. I’ve been busy with BADDIES promotion for the last few months, and I’m hoping to take a few days off to clear my head and figure out what to work on next. I have some picture book ideas as well as ideas for longer works; not sure which I’ll focus on next! These in-between times are an interesting combination of exciting and scary. When is your next project due out after GOOD NIGHT, BADDIES? HERE COMES TEACHER CAT, the fifth book in the Cat series, will come out in 2017, as will PART-TIME MERMAID (a companion book to PART-TIME PRINCESS). And SUPER SAURUS SAVES KINDERGARTEN, the first of two Super Saurus books, will also come out next year. I don’t know if I have one! Every book seems to be different. Rhyming picture books involve weeks of pacing around my apartment muttering to myself, with occasional dashes to my rhyming dictionary. Lyrical books require lots of mulling, turning things over and over in my head to try to get them exactly right. For the Cat books, I sketch out rough illustrations so I can get the flow of the page turns. For longer works, I resort to forcing myself to write for two hours a day or until I’ve written 1,000 words, whichever comes first. I find this makes me write fast so I can escape more quickly! 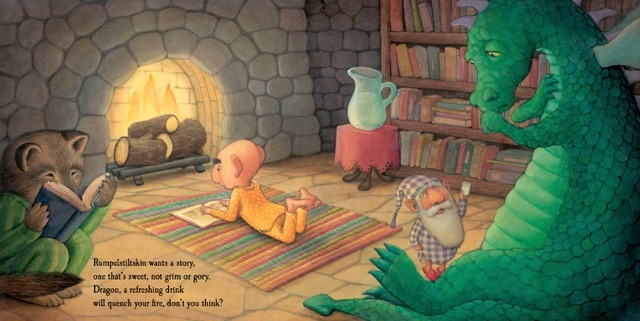 For aspiring picture book writers, I’d say read picture books. A LOT of picture books. I read hundreds when I was starting out. Pay attention to what works and—maybe more importantly—what doesn’t work, and why. And write! You’ll probably need to write a lot of not-great stuff before you can write good stories, and the sooner you get the not-great stuff out of the way, the faster you’ll progress. When I was in college, they were filming a movie in an auditorium on my campus. I dressed up in what I thought was a production-assistant-like outfit, waltzed past security, and snuck onto the set. It was awesome. I was and still am fascinated by the movie industry; I’d do it again in a heartbeat! Thank you so much, Deborah! Deborah Underwood is the author of numerous children’s books, including Good Night, Baddies; Here Comes the Tooth Fairy Cat; Interstellar Cinderella; and the New York Times bestsellers Here Comes The Easter Cat, The Quiet Book, and The Loud Book! She wrote the Sugar Plum Ballerina chapter book series with Whoopi Goldberg, and she has written over 25 nonfiction books on topics ranging from smallpox to ballroom dancing. 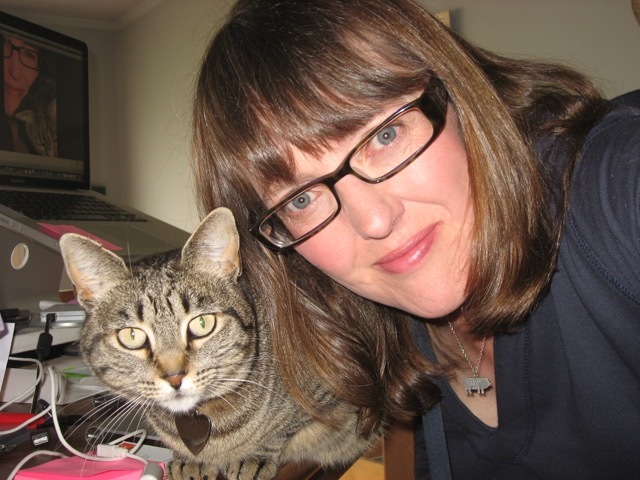 Deborah lives in Northern California with her feline companion, Bella. Yay, Deb, congrats on all your upcoming books (I'm getting exhausted just reading)! 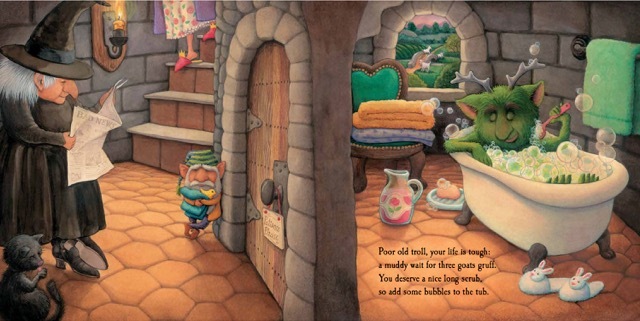 And your rhyming book process is a hoot; but what does Bella do as you pace and mutter? Okay, now I plan to try the walking around muttering idea. I've been writing sitting down and I need some inspiration. LOL! Seriously, can't wait to read Good Night, Baddies! Hope you enjoy it, Tanya! And seriously, I do think moving around (whether muttering or not) helps; I do a lot of thinking while walking around a lake near me. Oh, yay! Good to hear there's another Cat book coming out. I love those! Can't wait to read Baddies! And, LOL! I didn't know Deborah would be so sneaky when it comes to the film industry. :D Maybe Hollywood can be persuaded to turn one of her books into a movie?! Well, THAT would be awesome! And yeah, I surprised myself with the sneakiness, but I was determined. :) Bella and I are glad you like the Cat books, Teresa! Thanks for your advice, and what a fun book! GOOD NIGHT BADDIES looks delightful! I admire you so much, Deborah! I'm always so excited to read (and reread) your books. You are a great role model to follow! I hope to meet you one day soon! Will you be at SCBWI Summer Conference this year? You're so kind, Carrie! Alas, unlikely to make it this year, but possibly next! Would be wonderful to meet you in person, too! This book looks amazing! Can't wait to read it! I love your books, and I'm glad to find out a bit more about you, Deborah! Which movie did your 'star' in? Ha! I was just sitting there watching the filming, wondering if they'd figure out I wasn't supposed to be there. It was some movie starring Dudley Moore as a conductor, I think. So much fun to get insight into the process of writing a picture book. I can picture you walking around muttering while Bella looks on askance, thinking "why doesn't she quit that muttering and feed me already." this is so cute--what a fabulous idea! Congrats on your success! Thank you so much, Danielle! Just got this out of the library. My boys and I loved it! Oh, I'm so glad, Laura! Thanks! Can't wait to read your latest book! Thanks for the insight into your creative process. What great timing. 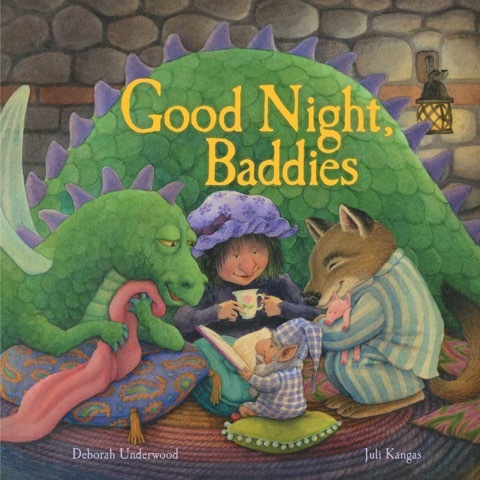 I was just thinking about Deborah, because I got an email from my library today saying the copy of GOOD NIGHT BADDIES I reserved is in. Yay! And I can't wait to see your next cat book. Thanks for the post. My pleasure--I hope you enjoy BADDIES! Yes! My carpet doesn't appreciate it! Congratulations on ALL your upcoming books! What an accomplishment! Wonderful! Can't wait to read your latest books.